Casino Heroes got six new slots this week - Try them out today! Casino Heroes’ team is always so quick to launch new games! In fact, over the past week or so, the gamified casino launched 6 new video slots! Indeed, Rainbow Riches Leprechauns Gold went live on 29th January. Cabaret Royal followed it on 30th January and days before that the casino operator launched four other slots, including two Play’n Go and NetEnt games to name a few! 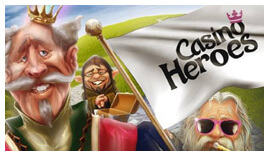 Since the beginning of January, Casino Heroes launch a total of 16 new games. And that’s excluding all the titles that the new deal with Iron Dog Studio brought to the table! But let’s have a look at the latest games and give you some insights into the new releases! Cabaret Royale is a burlesque slot by 2By2 Gaming and released by Microgaming. The game has a good jazzy soundtrack, 40 paylines and an RTP of 96.029%. Its low volatility will certainly appeal to casino newbies and so will the 1,000x stake max win! Rainbow Riches Leprechauns Gold by Barcrest will certainly get a lot of traction as the countdown to St-Paddy’s day start! In fact, its 7 reels, and 5 rows make this slot stand out from many Irish themed video slot. But let’s not forget to mention that this game also has an excellent variety of features including extra random wilds, Free Spins and Pick n’ Click game that will get even the savviest players engaged! As you know, Casino Heroes is proud to offer games from various providers including QuickSpin and Red Tiger Gaming. And in only days from now, both studios are planning big game releases! Indeed, on 12th February make sure to visit Casino Heroes and try Ticket to the Stars and Thor’s Lightning. They’re the next slots that’ll go live in the lobby, and many players cannot wait to try these games!